Often the first thing we do when we notice pain is to reach for a packet of painkillers. Non-steroidal anti-inflammatory drugs (NSAIDs) like ibuprofen are a good way to initially bring down inflammation of an injury, like an ankle sprain. However, high doses of these types of drugs should not be used for longer than 4 days because of the potential side effects, such as stomach pain, heartburn, and an increased risk of stomach ulcers. Therefore, more natural alternatives that also have anti-inflammatory properties can be used after 4 days to help reduce inflammation as well as avoid side effects to the stomach. 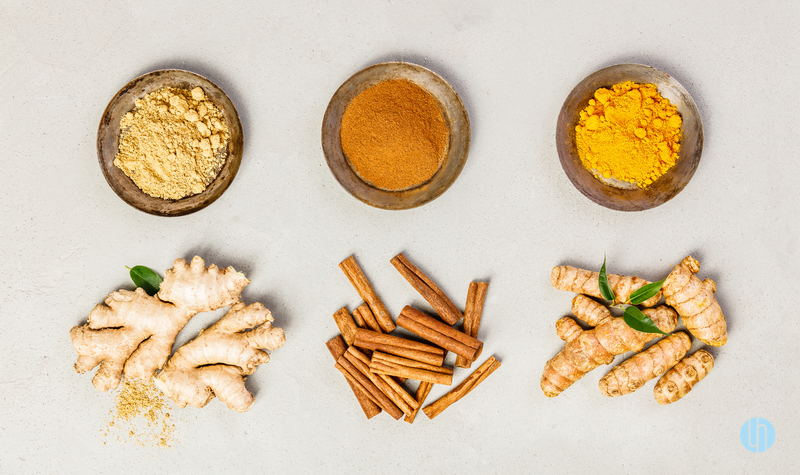 A common natural supplement with this anti-inflammatory property is tumeric. Tumeric contains curcumins, which has a strong anti-inflammatory effect. This compound is constantly surprising researchers by the extent of its anti-inflammatory abilities, most notably its effect on arthritis and osteoarthritis. It is also high in antioxidants, meaning it can help prevent damage to your body’s cells. Aside from being a fantastic addition to a wide range of meals, ginger is packed with many health benefits. Beyond inflammation, it can improve metabolism and help fight oxidative damage. The best way to consume ginger is, to eat the raw root, although it’s widely available in powder and supplement form, as well. Research suggests that the compounds gingerol and zingerone found in ginger are primarily responsible for the root’s ability to fight inflammation. They have been linked to reductions in many forms of inflammation, from colitis to kidney damage to diabetes and cancer. As delicious as it is nutritious. Many of the phytonutrients present in raw cinnamon are potent anti-inflammatory compounds. Cinnamon is loaded with antioxidants and flavonoids that are both known for having a positive impact on reducing inflammation in the human body. One of the main components of cinnamon, cinnamaldehyde, is known to inhibit certain proteins that are factors in causing inflammation, as well as preventing blood from clumping which further helps protect against other inflammation related diseases. If you are experiencing pain and need some more information on natural alternatives to anti-inflammatory medication, ask one of our Osteopaths for more information.